The biblical passage in Luke 24 known as the Road to Emmaus is – like many passages – twisted and misused, sometimes innocently, many times intentionally. 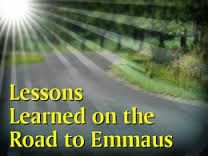 There is a mystical three-day retreat called The Walk to Emmaus (also known as Chrysalis) that was modeled after the Roman Catholic retreat known as Cursillo, which started in Spain in 1949. These two retreats are like identical twins – not the same, but very much alike. And both are embraced by a wide range of churches – including Methodist, Episcopalian, Lutherans, Presbyterian, and Baptist. You can read about The Walk to Emmaus here: http://emmaus.upperroom.org/ Their FAQ are most informative, and all copyrighted. Here’s another web site where a Baptist who attended one of these retreats discusses the event and explains why evangelicals should not participate. All that background to bring your this – a wonderful sermon from the text of Luke 24:13-35, wherein we are reminded that the Lord opens eyes to see truth, that seeing is not believing, and that those who are given sight and hearing will respond to the Savior. Pull up your chair and give a listen – you will be glad you did. This entry was posted in Bible Reference Notes, Encouragement, Expository Moments, Roman Catholicism, Sermons, Sola Scriptura, Theology and tagged Apologetics, Bible, The Stranger on the Road to Emmaus. Bookmark the permalink. The article by the Baptist preacher was informative…Till he went all Baptist mystical with his suggestion to copy the weekend complete with Blackaby’s “Experiencing God. Good post though, and timely as the romish highway is making great inroads into all of churchianity at a very rapid rate. Thanks for the warning brother! I agree with you, Mickey. Too many Baptists have been misled by Blackaby – who is no better than those from Cursillo. We are complete in Christ and His Spirit gives us understanding of His Word – not some emotive gathering in the name of sloppy agape.